Japan has launched a new Information Gathering Satellite (IGS) known as Radar-4 – along with a demo satellite – via their H-2A (H-IIA) launch vehicle. Amateur footage of the launch provided confirmation of a successful lift off from the Yoshinobu Launch Complex at the Tanegashima Space Center (TNSC) at 04:40 UTC in the early hours of Sunday. The launch vehicle (F-22) used was the 202 version of the H-IIA rocket equipped with two solid rocket boosters with the 4/4D-LC fairing. Mitsubishi Heavy Industries, Ltd. is charged as the launch service provider for the H-IIA. The H-IIA can be launched in various configurations by installing additional solid rocket boosters. Its first stage has a length of 37.2 meters, a diameter of four meters and a mass of 114 tons. The stage burns a mixture of liquid oxygen and liquid hydrogen, developing a liftoff thrust of 1,098 kN. Its burning time is of 390 seconds. The H-IIA/202 is equipped with two solid rocket boosters. Each SRB-A has a length of 15.1 meters, a diameter of 2.5 meters and a mass of 77 tons. This solid boosters burn a mixture of polybutadiene composite solid propellant, developing a liftoff thrust of 2,245 kN each unit. The SRB-A operate for 60 seconds. The second stage has a length of 9.2 meters, a diameter of 4 meters and a mass of 20 tons. The stage burns a mixture of liquid oxygen and liquid hydrogen, developing a liftoff thrust of 137 kN. Its burning time is of 530 seconds. The H-2A is capable of launching a cargo of 4,000 kg to a Geosynchronous Transfer Orbit (GTO), 10,000 kg to a Low earth Orbit with a Inclination of 30 degrees, 4.000 kg to a Sun Synchronous Orbit or 2,500 kg to a planetary mission. The Information Gathering Satellite (IGS) is a military spy satellite system, which was designed as a response to North Korea’s 1998 missile test over Japan. The primary mission is to provide early warning of impending hostile launches, with a focus on Japan’s troublesome neighbor of North Korea. During their initial operational phase of the IGS mission, a pairing of satellites flew on a 492 km orbit at a separation distance of 37 minutes, as they made passes over the North Korean capital each day. However, this opening duo of satellites in this IGS range – the 1A and 1B – were incapacitated four years after their March 28, 2003 launch – also via a H-IIA vehicle – as one of the pair lost its radar ability. 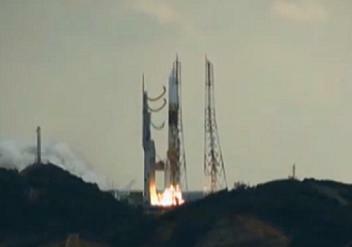 They had expected to be joined by a second pair of IGS satellites – 2A and 2B. However, they were both lost via the H-IIA launch failure of November, 2003. A second optical surveillance satellite – IGS 3A – was launched on 11 September 2006. A third optical satellite – IGS 4A – and a second radar satellite – IGS 4B – were then launched on 24 February 2007. IGS 4A is classed as a advanced and experimental optical satellite. ISG 4B has since been incapacitated, due to an inability to carry out its monitoring functions. A fourth optical satellite – IGS 5A – was launched on 28 November 2009, advancing the resolution ability when compared to the previous satellites. At the end of 2011, Japan launched Radar-3, returning the full operational capability for Japan’s IGS system. This followed Optical 4, which was also lofted uphill via the H-IIA launch vehicle from TNSC. Sunday’s launch saw Radar-4 head into orbit, a satellite that has been classed as the same model to Radar-3, likely sporting a resolution capability of less than a meter. It was also joined by the Optical-5 demo sat, of which very little is known.